500ml ,1 ltr, 5 ltr. 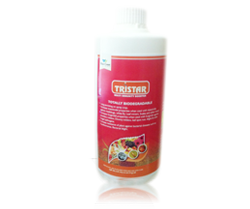 Tristar is a mix oil formulation consisting of three oils Neem Oil, Fish Oil and Karanj Oil hence it derives its name as Tristar. Tristar is a Mix Oil formulation. Effective for control against Inseets, Bacterial & Fungal Infection. Long persisting on spray crop. Increases insecticidal properties when used with insecticide against mealybugs, white fly, Leaf miners, Scales and other insect. I Increases fungicidal properties when used with fungicide against powdery mildew, Downy mildew, leaf spot rust, blight & other fungul pathogens. Mix 2-3 ml of Tristar in 1 liter of water spray with Insecticide /Fungicide at the time of spraying. Floriculture,Cotton, Grapes, Pomogranates, Chillies, Tomatoes, Capsicums, Cucumbers, Cereals, Pulses, Sugarcanes and Horticultural Crops etc.